In the document dump by Auckland Council recently on Light Rail to the Airport (the Northern Airport Line (Central Airport Line per the Congestion Free Network maps)) (see: Auckland Council Announces Northern Airport Line (forgets its Southern sibbling)) Auckland Transport outlined some critical risks into accelerating the project to have at least the City Centre to Dominion Road section completed by 2021. If you're going to take the moral high-ground about there being better uses for money, try including some of the social costs of bus and vehicle congestion in the CBD and the resulting emissions/diesel fumes which can't be that healthy either. The City Centre can not handle the busses it has not and certainly will not be in a position to handle more in the 2020’s and beyond. I can also perfectly understand not wanting busses clogging up Queen Street and Queen Street becoming a pedestrian mall in 2021 ready to showcase when both premier events are on. But to do this (basically de-bus the City Centre) we need at least the Northern Airport Line (Central Line) and the North Western Line up and running so transit passengers can transition from bus to light rail. Cue the Government wanting to get both Light Rail lines started sooner rather than later (one has already being confirmed by the Transport Minister). However, enter some rather large risks – mainly the City Rail Link construction in the City Centre at the moment. CRL bunging up Light Rail Works? It has already been debated more than once that Light Rail up Queen Street would not start until the City Rail Link was completed and operation in 2024. This is because the CRL works up Albert Street are already messing bus patterns around and to then start digging up Queen Street and Fanshawe Street is really going to mess up bus patterns especially from the North Shore. The recently released documents into accelerating the Queen Street to Dominion Road section of the Northern Airport Line/Central Line outlined critical risks to delivering that particular section of Line and not just on procurement grounds either. Any accelerated programme would be a departure from the strategic direction of the current programme for mass transit, which is focused on the Airport to City Centre corridor (A2C) and includes a business case for route protection as outlined in the February and March 2017 AT and New Zealand Transport Agency Board resolutions. While the focus of the current Mass Transit Project is on the entire corridor and will investigate a transition solution through to a LRT type solution, this report only considers acceleration of LRT for the America’s Cup event and focuses on accessibility between the Wynyard Quarter to the City Centre (alignment A and B and a main Depot at Stoddard Road refer to Appendix 2). The report also includes accelerating, along with the LRT for alignment A and B, a bus-based solution (alignment G) between Auckland Airport and Puhinui by December 2020. This will provide additional airport access in time for the two major events. It is not feasible to deliver LRT on the full Airport to City Centre corridor in time for the major events scheduled for 2021. The accelerated programme outlined in this report is unprecedented in timescale and scope and involves considerable risks. There are no international examples of LRT being delivered within the proposed timescale that the AT and its advisers are aware of. However, there have been precedents set by Auckland Transport with regard to projects that have been implemented in restricted timeframes and have set international examples of best practice, including HOP card rollout, EMU programme and New Network. The key risks to this project include market capacity, complex structural engineering requirements, procurement timeframes and legislative decision making processes. Should a decision be made to progress an accelerated programme, the delivery of LRT and would require a number of conditions to be met (outlined in this report). Failure to achieve this in the timeframe will remove any chance of delivery. depot facility at the Stoddard Road end of the route for heavy maintenance and testing and commissioning, all of which bring considerable risk to the programme given the condensed timeframe. Procurement Management –the Government and Council will need to support appropriate processes and controls to manage the governance and risk associated with an accelerated and bespoke procurement approach within the market. 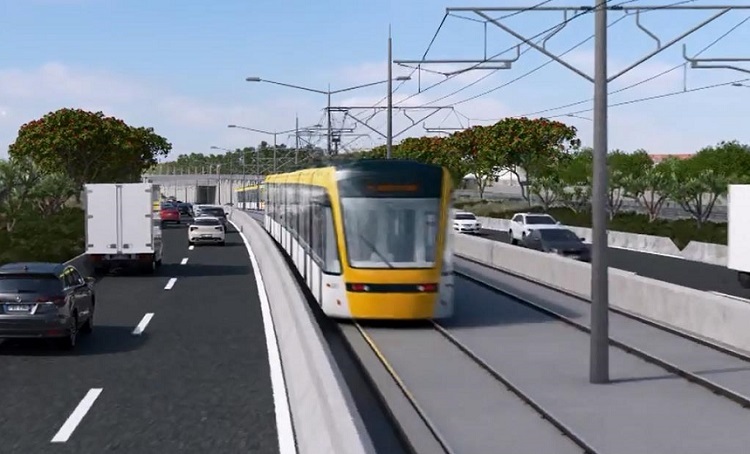 Market Capacity – present market conditions indicate significant constraints in capacity and capability within both the New Zealand and global market for LRT, which could impact on the accelerated programme assumptions. This could have an impact on the ability to deliver on time and within budget, (particularly in the construction and infrastructure sector relative to the various contract packages and timescales required). Cost/Funding – an overall indication for the entire system, taking account of design, construction, systems and rolling stock is between $930m-$1205m, which is dependent on the scale and scope of the programme. This estimate does not include any cost premium that may be associated with accelerated delivery. 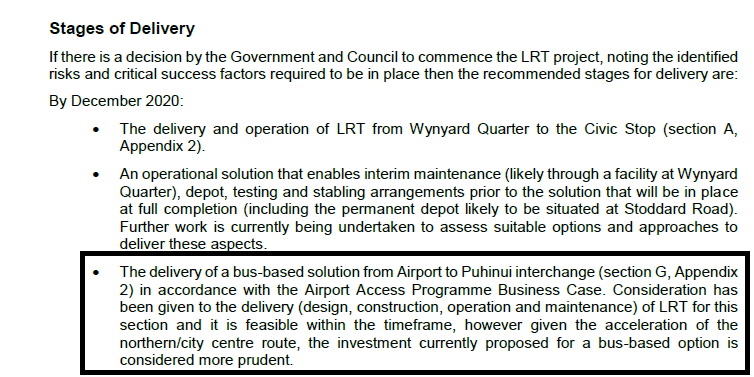 The figure excludes costs associated with the bus-based solution from Airport to Puhinui interchange (section G, Appendix 2) in accordance with the Airport Access Programme Business Case. These costs are yet to be confirmed. In addition, unilateral political and key stakeholder (NZTA, MoT, Treasury, Auckland Council) support and commitment is critical to ensure funding is available. Without unilateral support there may be risks to decisions and approval and a lack of clarity with regard to funding. Operational Requirements – this is linked to procurement as there is a required lead in time of approximately three months to allow for systems and fleet testing, safety auditing and quality assurance. This requires rolling stock procurement to be underway by December 2017 to ensure that units could be delivered prior to 2020. The text in magenta is an eyebrow raiser given HOP was malaigned due to the Snapper disaster before it, the EMU’s took longer than anticipated for roll out then were plagued with power supply faults that knocked them out until an upgrade was done, and the New Network has been delayed constantly and South Auckland still does not have its bus lanes to back up the frequent network busses like the 33 Great South Road service. I also note that Auckland Transport is no longer mentioned in the document so I am pondering if NZTA has taken the full lead on all LRT Lines and the Southern Airport Line. The ‘Deliverability’ section outlines the main problems although it has not mentioned the relocation of a 220kv oil filled Transpower power cable on Fanshawe Street that delivers power to the North Shore (the issue is mentioned later on). The CRL works are currently between Britomart and 135 Albert Street (Council HQ) however, by 2021 that section should be mostly complete and main works focused at the K Road and Dominion Road flyover (Mt Eden Junction is in that area) ends of the project. Dominion Road brings in the central Isthmus busses while K Road brings in the West and North West busses so no matter where the CRL works are busses are going to be highly disrupted. Auckland Transport (as insurance to allow an express connection between the Airport and the City Centre) have said get the first leg of the Southern Airport Line (Airport to Puhinui and Manukau) done at the exact same time. What was surprising is that Auckland Transport also said it was feasible to build that section of the Southern Airport Line as Light Rail and have it all done by 2021. However, due to unnecessary political pressure on its Northern sibling (at very high risk in trying to deliver it) AT have relegated the Southern Airport Line to Bus Rapid Transit. In other words if we took things rationally and logically (Mr Spock) we would start with the Southern Airport Line as LRT right now given it can be done by 2021 to Puhinui and Manukau. This allows us the breathing space to properly map out the Northern Airport Line as Auckland Transport have said and time the works to reach Queen Street post City Rail Link in 2024. I will say that the acceleration of the Northern Airport Line – at the expense of its Southern sibling and also in pure prudence looks like someone is trying to get a Show Boating project off the ground in time APEC. Auckland Transport have said delivering the Northern Airport Line as maximum warp is extremely risky (political and reputation fall out is also extreme if the project is cocked up) while delivering the Southern Airport Line as LRT has been considered – and gives best bang for buck in what we are trying to achieve (express to the Airport). Let’s take a step back with the Northern Airport Line, re-evaluate what we want from it and in the meantime get the Southern Airport Line done as LRT right now. If nothing else – do it for PRUDENCE sakes! Back to the Future huh? reverse the process. 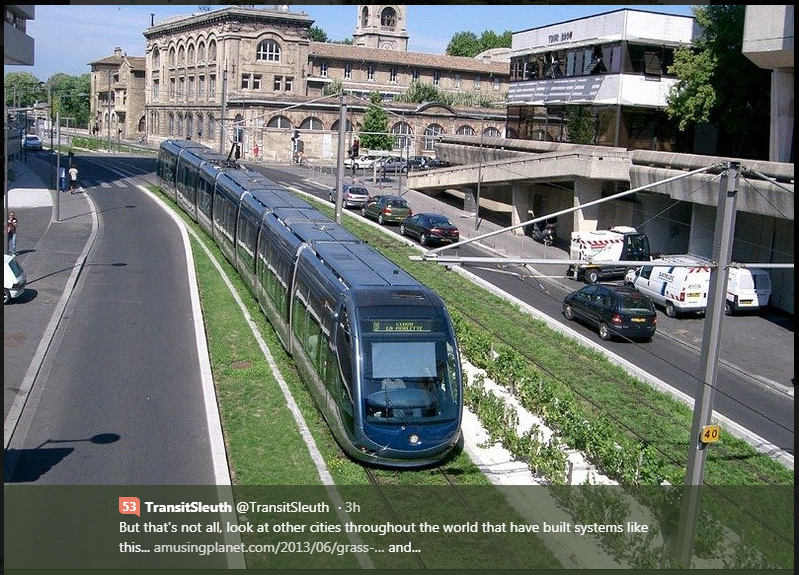 Forget light rail. heavy rail FROM Manukau/Puhinui via airport to Onehunga and back to main line at Westfield. Run Light rail from Onehunga into CBD with branch lines down Domion Rd etc. I’m old enough to remember riding trams from Onehunga into the city. I think it went to Mays Rd depot but a spur ran down Queen St Onehunga as well. GrandFather used to take me on that one. It would have to go straight down SH20 – so you’d miss a bit of catchment potential. Plus you lose the extension option to the east. Airport also prefer the LRT option. Main problem is HRT track capacity. Even with the CRL adding a new airport line service would cause complications. My grandmother also rode the trams into town from Onehunga.